I really like raw veggies most of the time. I’m am amazed when people visit my home and are surprised that my kids like raw veggies too. I thought everyone ate them. We’re not vegans or vegetarians, but sometimes I like to challenge myself to create a vegetarian recipe that will please people on both sides of the spectrum. If my husband will eat the vegetarian recipes then I’m pretty sure the most carnivorous of beasties will eat them too. This creamy vegetable soup was a vegetarian success. The first thing after I preheated the oven to 425 degrees, was clean, and trim the vegetables: asparagus, mushrooms, green bell pepper, and cauliflower. Then I drizzled them with a little olive oil and roasted them for about 40 minutes. Meanwhile, about 20 minutes into the roasting time, I started the garlic, shallots, and celery in the stock pot. A couple tablespoons of olive oil, a flame on medium heat (I have a gas stove), and I was good to cook them for about 10 minutes until translucent. Once my stock pot ingredients were done, I added vegetable broth and brought everything to a boil. I then chopped up the veggies from the oven after they were done roasting…and added them to the stock pot too. After boiling for about 15 minutes, I turned the heat off. Once the heat was off, I added an avocado to thicken things up and to give it a rich, creamy texture without affecting the flavor too much. To blend things, I used an immersion blender. I put it right in the hot soup in the pot. I used to pour it in batches in my blender/food processor, but I’m glad those days are over. The immersion blender is so much easier, and I have a ton less to clean. Who’s got time for cleaning extra junk in the kitchen? I’ve got kids who want to eat the creamy vegetable soup. After the soup got nice and creamy, I added seasoning: white and black pepper, ground coriander, and salt. The amount I used will give it a nice kick, but if you don’t care for heat, adjust to taste. Once it was in the bowl it looked a little boring so I added a dash of smoked paprika on top to liven up the taste and give it a color pop. Roasted cauliflower, asparagus, mushrooms, and other veggies, all transformed into a spicy, rich & creamy soup. Wash and trim all vegetables. Preheat oven to 425 degrees. Drizzle the vegetables (cauliflower, asparagus, mushrooms, bell pepper) with half the olive oil and roast in the preheated oven for 40 minutes. Chop into small pieces once done. In a stock pot, heat the remaining oil on medium heat and cook the garlic, shallots, and celery until translucent. Add the vegetable broth to the stock pot and bring to a boil. Into the boiling vegetable broth, add the roasted vegetables and cooking wine. Allow the soup to boil for 15 minutes. Turn off the heat and add the avocado to the stockpot. Blend the contents of the soup using an immersion blender directly in the stockpot. 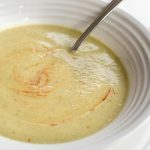 Continue until the soup is completely blended and creamy. Season to taste with coriander, black and white pepper, and salt. Sprinkle a dash of smoked paprika on top and serve warm.